Here in Palm Creek, we have many pot lucks. It makes life easy because no one person has to do a lot of preparation and we all get to try different dishes. Recently, I needed a dish and decided to do an old favorite, Jiffy Corn Casserole. I just did the basic version with out any of the optional ingredients because that is JC's favorite. Yum, yum, yum!! Corny and velvety and rich - perfect comfort food! Preheat oven to 350 degrees and lightly grease a 9x9 inch baking dish. 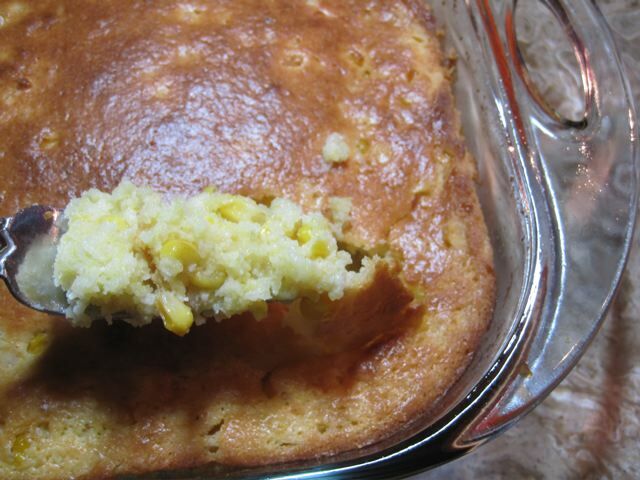 In a medium bowl, combine butter, eggs, corn bread mix, whole and creamed corn, and sour cream. Spoon mixture into prepared dish. 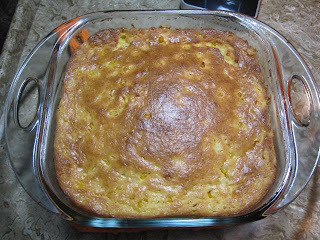 Ok, send me some jiffy cornbread mix when you can. This is torture reading about all of your good "fixins". Love it! Yummy! A - I will put some in your next care package! !